a glycoprotein growth factor that causes the committed cell line to proliferate and mature into macrophages. a glycoprotein growth factor that induces committed bone marrow stem cells to differentiate and mature into mononuclear phagocytes. A cytokine encoded by CSF1 on chromosome 1p21-p13 that controls the production, differentiation and function of macrophages, and which may play a role in placental development. any of the large, mononuclear, highly phagocytic cells derived from bone marrow cells, promonocytes, the progeny of which, the monocytes, enter the bloodstream, where they stay for a few days before entering the tissues and developing into macrophages. They are components of the monocyte-macrophage system. Macrophages are usually immobile but become actively mobile when stimulated by inflammation, immune cytokines and microbial products. They are an important class of antigen presenting cells (APCs). See also immunity. under the influence of cytokines, particularly γ-interferon and interleukin 4, released by antigen-stimulated Th1 lymphocytes, resting macrophages are activated whereby they become larger, more motile, stickier, express more MHCII proteins on their surface, contain more lysosomes and lysosomal enzymes, and secrete a variety of substances including interleukin 1, tumor necrosis factors; they have increased phagocytic activity and increased killing via reactive oxygen intermediates, collagenases and lysosomal enzymes. Called also angry macrophage. a lymphokine produced by T lymphocytes following in vitro, probably γ-interferon, antigenic stimulation that activates macrophages. rounded, granular, mononuclear phagocytes within the alveoli of the lungs that ingest inhaled particulate matter. those capable of inducing cytotoxicity as a consequence of binding antibodies via Fc receptors on their surfaces or by factors derived from T lymphocytes (specific macrophage arming factor [SMAF]). a lymphokine that attracts macrophages. a lymphokine that inhibits macrophage migration, causing them to accumulate at the site of antigen. 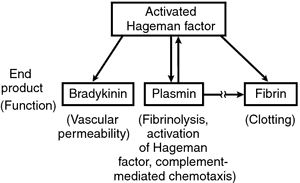 a lymphokine that stimulates macrophage cytotoxic activity.